These holiday ornaments for the birds don’t come so cheap… that’s why it’s best to protect them from the elements. Using an ordinary hanging squirrel baffle works, and so does a rain guard. They come in clear plastic, so they won’t detract from the decorative aspect of the seed ornament itself. Hey, some are even available in red or green too. Another alternative would be to hang these seed treats in a sheltered area. A porch or deck that offers some kind of protection from the rain is a good plan. Believe it or not… these cute holiday seed ornaments are quite good for the birds! Many are packed with chopped peanuts, pecans, dried fruit, and sunflower seed, giving birds a high fat and protein-rich treat. The extra calories consumed are converted into energy that helps birds stay warm during frigid temperatures. The most effective way to foil squirrels and protect your feeders from their disruptive antics, is with a squirrel baffle. A quality baffle is a one-time investment that will save your birdseed and ultimately your money in the long run. The best part about using a hanging squirrel baffle is the versatility. Some folks even use them as weather guards alone (like me) to protect feeders from the elements. Most will serve as weather guards throughout the changing seasons. Keeping snow in winter, rain, and direct sun in sweltering summer heat, from ever reaching and spoiling the bird food. This will also save money by keeping food fresher longer. 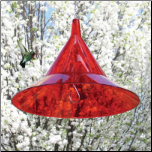 Not to mention, squirrel baffles also protec t feathered friends at your feeder while dining. 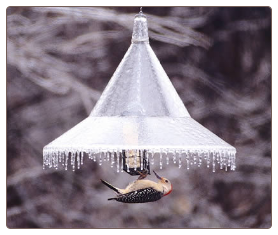 Although this feeder hangs from a pole with a baffle in place, one is also used to protect the feeder. Check out that snow sitting on top! Planning and proper placement are two key factors when setting up new baffles. One must always remember squirrels’ uncanny acrobatic and athletic abilities! The little furry critters can jump sideways almost 10 feet. So, the horizontal “launching point” must be taken into consideration. Don’t hang the feeder near anything they might be able to jump from sideways. Vertically speaking, be sure the bottom of the feeder is at least five feet from ground level. All in all, a great investment for novice to advanced backyard birders. Sparing you much aggravation and headache should squirrels be a problem in the yard.